Edit menu is used to set the overall model properties and as an alternative to buttons in the toolbar. Model Description … opens a dialog box to describe the model in words. 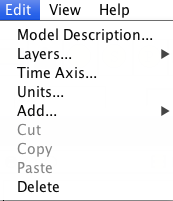 Layers … opens a dialog box to add, deselect, rename and organize model layer. Time Axis … opens a dialog box to define a time axis. Units … used to specify which units for flows in each model layer. Add … used as an alternative to the buttons in the toolbar to add components to the model. Cut, Copy and Paste is not clear yet. Delete deletes a selected component.